After Dalit leaders created a storm in Parliament today over a Class XI political science textbook featuring an allegedly offensive cartoon of Dr B.R. Ambedkar, the Government said it had ordered withdrawal of the cartoon and stalled further distribution of the book �Indian Democracy at Work�. NCERT's chief advisors for the political science subject resigned today over the row surrounding a cartoon featuring Dr BR Ambedkar in a class XI textbook, saying the entire controversy was "tragic." 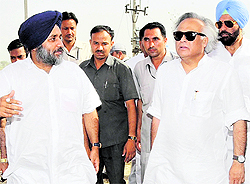 Union Rural Development Minister Jairam Ramesh today promised a special grant for development of infrastructure in the border villages of Punjab. In a virtual free-for-all, soldiers and officers of an Army unit posted at a remote area of Ladakh clashed among themselves after a jawan allegedly misbehaved with an officer�s wife yesterday. 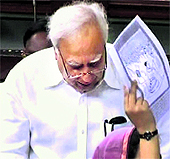 With the Air India crisis being discussed at the highest level on Friday, there was hope that an end to the standoff could come about soon. The CBI on Friday registered cases of cheating and corruption against three Defence Estate officials and conducted simultaneous searches in Srinagar, Jammu, Ambala, Delhi and Patna in connection with the alleged irregularities in the sale of military land near the high-security Srinagar airport. 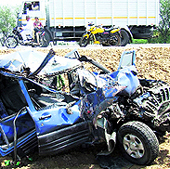 Haryana�s �killer roads� claim a life every two hours while one person is injured every hour. Roads in the state have claimed 1,461 lives while 2,962 persons were injured in the past four months. Haryana�s millennium city, Gurgaon, has reported the highest death toll of 151 though it has the least number of accidents at 41. The number of injured was the highest in Gurgaon with 311 persons reported injured during January-April this year, revealed data with The Tribune.